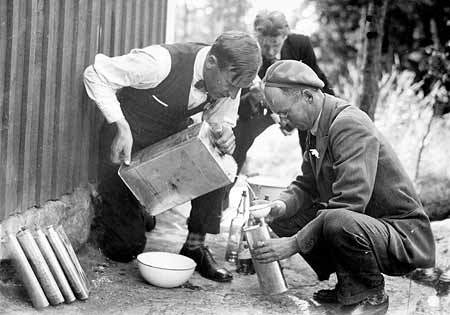 No longer the moniker for an illegal and highly flammable distillation, Moonshine is the new black. It’s also the best kept Holiday Secret. If you see my wife and I imbibing, generally we’ll both be enjoying a rum based cocktail, or she will be partaking in the age old “sidecar.” During the warmer months, you’ll almost always find us downing something decidedly tiki. In my college days, “moonshine,” “White lightning,” “sneaky pete” or the more aptly named “dumpster fire” were illegally made spirits, with no time for an aging process whatsoever, that tasted as if they were strained through a Ford Fiesta radiator. 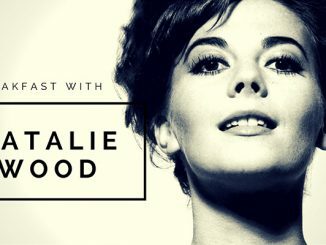 (in the early days of the 20th century, car radiators were the “preferred method.”) During the days of prohibition, these backwoods concoctions invariably left you reeling like a sledgehammer smack to the frontal lobe, and more times than not, blind. Like, really blind – the lead and glycol inherent in these syrups were toxic. Today, while the Jackass generation likes to cheat death, the older set (myself included) likes to pretend they do. Thus, the proliferation and uptick of products named for previously illegal products; like moonshine. (As well as the recent advent of bonafide Absinthe – that for another time and article). 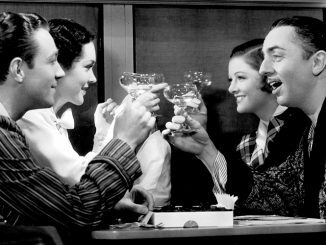 Mrs. Sheeler and I decided to do our very own Moonshine Tasting – a completely unscientific and subjective exercise which I implore you all to try. For our experiment, we sampled four different moonshines; two of which were variations of the same label, and only three of which were actually based on corn distillation; which is supposed to be the only real defining ingredient of the product. So we started out fudging already. Okolehao (pronounced “oh-KOW-lay-how” when sober, or” OkeeFenokee” when you’ve had a few) is crafted from the root of the ti plant, a vibrant flora grown all over Hawaii, most closely akin to Asparagus (!) Well before locals and tourists were sporting tiki shirts and mai tais, this was the common drink, its ingredients so plentiful the residents had to do something with it. Production (legally and illegally) was halted for several decades, when it was bastardized from the mainland and presented as a flavored whiskey in the 60s and 70s. By the 1990s it was no where to be found. Finally in 2005, Hawaiian Distillers gave another whack, and this time, the drink was celebrated and enjoyed, and as most things do, found its way to the mainland (barely – your best bet is to order it online). Of the moonshines we sampled, Okolehao is the most potent, with the highest burn-to-pleasure ratio. This is not a sipping ‘shine. The aroma is straight out rubbing alcohol. It’s 100 proof, and should be enjoyed wearing flame retardant clothing, as you will definitely be doing a torch dance with more than a couple sips. The first taste is clean and surprisingly sweet, with a slight hint of citrus in the middle and that final, gasping burn that makes its way from the back of your throat to your colon. 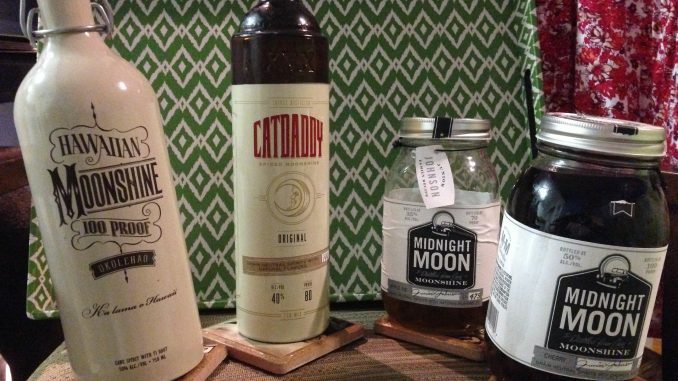 And while almost all moonshines should be mixed with something, they can work as a base for your tiki drink, as long as you make sure to level it out with a good dark rum or floater. My recipe for Okolehao is with a 60 – 70% ratio of POG (Passion Fruit – Orange and Guava juice) for an instant and easy tiki-ish rendering, or – if you’re not into sweet drinks – a shot of lime juice or lemonade. You don’t want to mask the Okoleho entirely, but you definitely want to make it palatable if you decide you want to cover the pure alcohol flavor by over drinking, thus ending your night fast. 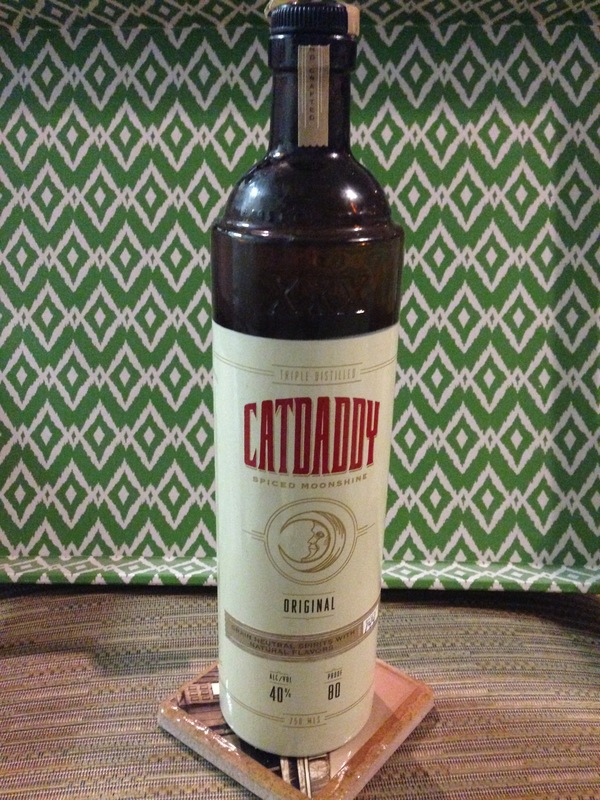 Next up is Catdaddy, which I can already say is my hands down favorite moonshine. This is triple distilled corn liquor from the Carolinas, with a decent serving of nutmeg and vanilla, which is the first aromatics you’ll encounter when popping that jug. One sip and you’ll know why this is a chilly weather concoction. It tastes like Thanksgiving. Its spiciness and cinnamon notes accompanied by very little burn make it an excellent all around good drink with no need for mixers. Drink it straight and you’ll be ready for the turkey and pumpkin pie. If you must mix this 80 proof glass of deliciousness, try it with a little Ginger Ale or even finish your presentation off with a peppermint stick swizzle. This is the sipping man’s (or woman’s) ‘shine that delivers a bracing alcohol flavor with just enough spice to satisfy even the “neatest” bourbon imbiber. We moved next, (after a quick break of microwaved cheese tortilla snackoliciousness) to the two Midnight Moon flavored ‘shines. 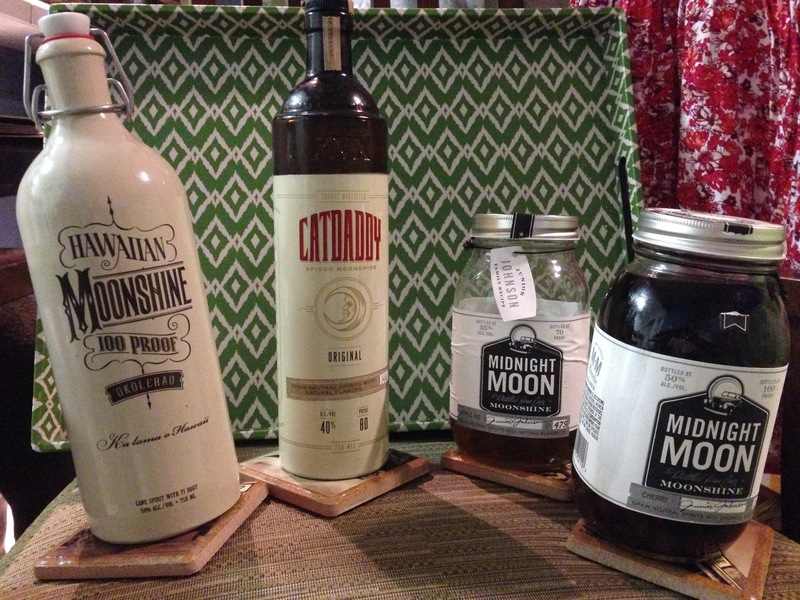 Piedmont Distillery’s label, Midnight Moon, offers the widest variety of fruit flavored ‘shines, everything from Apple Pie and Cherry to Peach and Blueberry. Midnight does offer two unflavored ‘shines, the Original and the 100 Proof – the 100 proof is pretty dangerous, but still doesn’t – to my mind – offer the burn and the smoothness of the Okolehao – but that’s also cause I’m partial to almost everything South Pacific. 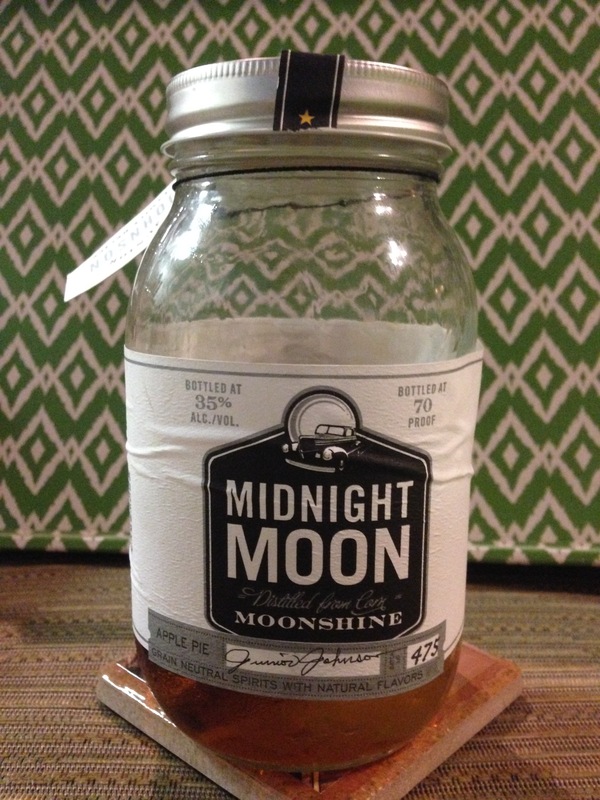 For a corn whiskey that’ll “get ‘er done,” Midnight Moon’s 100 Proof ‘shine drinks dandy fine. The fruit flavored ‘shines, though, are another matter entirely. 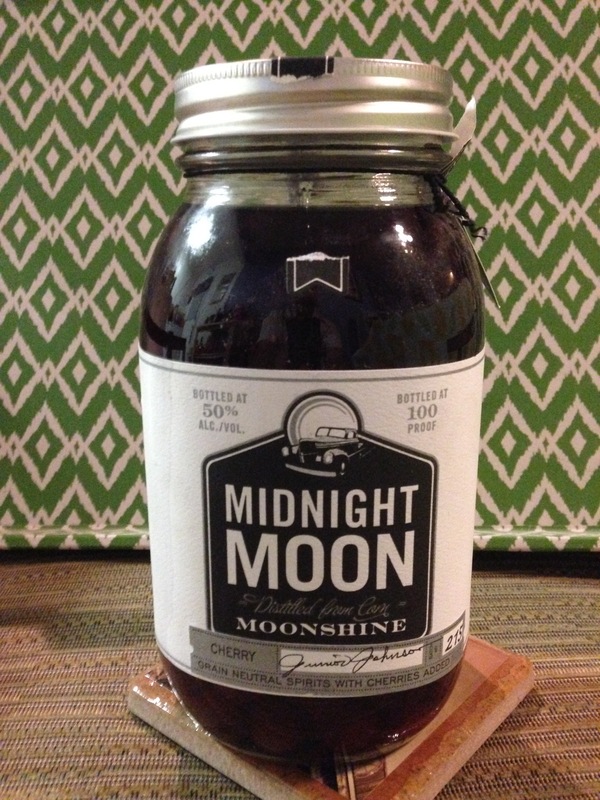 Boasting a real piece of fruit in each mason jar (yes, they’re bottled in mason jars, for that real bootleggin’ feel) Midnight Moon tries to appeal to the farm fresh ingredient set. Our third shine, then, was Midnight’s Apple Pie – and it is exactly what you’d expect. The aroma is slight apple with predominant cinnamon notes, but a flavor that has the cinnamon front and center and a very clean finish. By the way, it’s absolutely damn delicious and again, another ‘shine that needs no mixing. Straight is the way to enjoy this bit of bite. However, for a truly yuletide spirit, add a 1/4 glass cranberry juice, and what-the-hell, mix in some Ginger beer, heat it on the stovetop and you’ll be hard-pressed to find another beverage this close to Wassel – unless of course, you’re drinking Wassel. If Catdaddy is Thanksgiving, than Midnight’s Apple Pie is Sugar plum faieries with a bit of three wise men for good measure. It’s also the perfect hot toddy when you feel the aches a comin’ on. Sadly, our tastings ended on a sour note. So euphoric were Mrs. Sheeler and I with our successful ‘shines that we unscrewed the lid of Midnight Moon’s Cherry, and it was the gut busting syrup swallow we were fearing. Yes, it’s 100 proof, as we ended up full circle with our alcohol content, but the flavor was classic NyQuil. A high burn finish combined with a fake cherry flavor – even though there was a real cherry skulking somewhere in the murky bottom of the jar – was not what we were looking for. At this point, juiced to the gills, we splashed some left over cranberry juice in a glass (probably 50% mix ratio) and found it hid the most prevalent notes, subdued the burn, but allowed for a smoother wash over the palette. We also discovered the reason for spittoons. 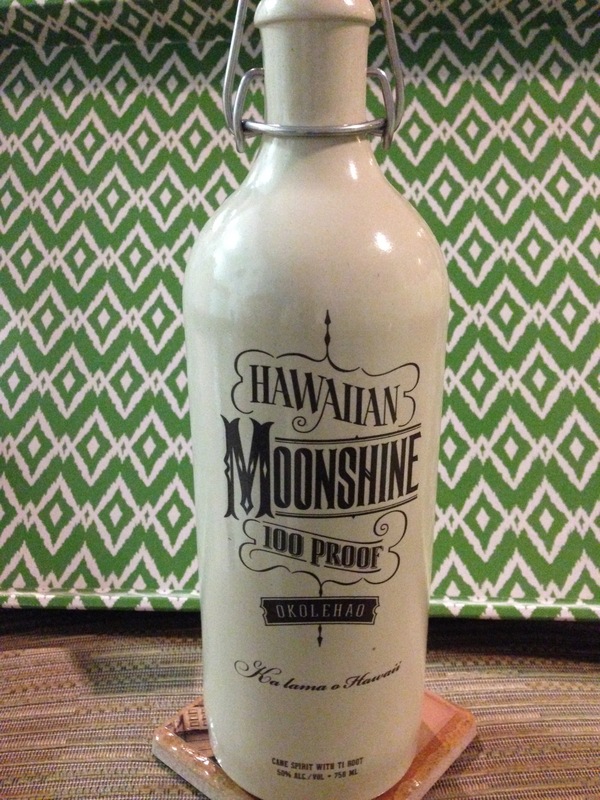 With so many moonshines proliferating the market nowadays, there’s also greater room for error, but if you are looking for a clean snort that offers abundant variations and the option for slight personal touches, you can’t go wrong with Hawaiian Moonshine, Catdaddy or Midnight Moon. And you’ll definitely make your holiday party the stand out of the season with spicier ‘shines that offer surprising notes of the season. 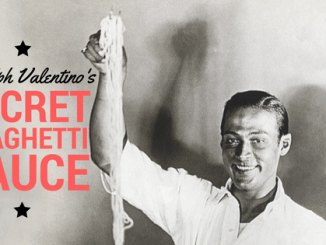 Even if you’re sipping from a jar.